This microscape was digitally stitched together from multiple field scans from a Scanning Electron Microscope. The base surface is made of highly aligned, dense zinc oxide nanorods, which were grown inside a tube furnace system by oxidizing zinc foil at high temperatures. The higher, complex structures are also made from zinc oxide, which were grown by absorbing the reactants from the vapor. The nano structures were created by UGA Physics and Engineering Assistant Professor Dr. Zhengwei Pan and his research associates. The increasing popularity of neuroimaging studies among the research community in recent decades has also garnered interest from the media. But there is concern that coverage of controversial topics, such as the ability of fMRI to “read minds”, has sensationalised the neuroimaging field and led to mounting criticism and skepticism. In order to explore this phenomenon, we mapped the frequency and tone of research and review articles regarding fMRI published in the journals Science and Nature. We also examined the frequency and tone of the newspaper articles that reported the results of these research articles. The results indicate a distinct trend in the level of interest in neuroimaging studies, the topics of research, and the concomitant criticism over time. It appears that while more sensational research articles generate more media coverage, they also receive more criticism from within the scientific community. The results also provide tentative support for the existence of a classic “hype cycle” that may raise important questions about public perception and the long-term integrity of the neuroimaging field. This paper analyses an overlooked tension between the right to personal identity and the collective right to human identity in the context of human rights law as it applies to prospective human genetic modification. While the right to personal identity may justify a valid interest in the modification of one’s individual genome, the collective right to identity defends a global interest in the preservation of the human genome. Taking this tension into account, the article identifies a number of contradictions and problematic issues in the current international legal regulation of the human genome that undermine the right to personal identity. These are the cases of the notion of the human genome as common heritage of humanity and the unfounded idea of species integrity, among others. The article also argues that the Universal Declaration on the Human Genome and Human Rights (UDHGHR) and the Oviedo Convention, together with the UNESCO Bioethics Committee, adopt a “geneticist-identity framework” which favours a conception of human identity solely based on genetic components. By prohibiting any change to the constitution of that shared genetic inheritance, those international legal instruments place an unjustified brake on the possibility for human genetic modification. This, as the article explains, is at odds with the “personality-identity framework” of the European Convention on Human Rights Law (ECHR), which privileges a narrative and developmental idea of individual identity. Popular and academic objections to patents over human genes are legion. Although some concerns about the negative impact of these patents have declined recently, questions persist as to the effect of gene patents on genetic testing. 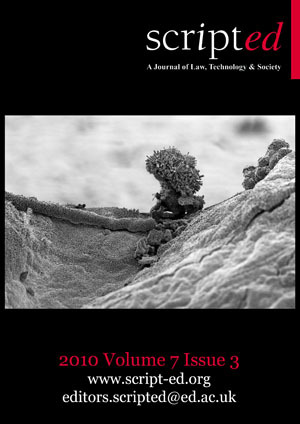 This paper undertakes a timely reappraisal of the patentability of human genes in Europe, by reference to EPO and English case law, and demonstrates that isolated DNA and the associated diagnostic tests remain patentable in Europe, although recent cases indicate a sensible tightening of the patentability requirements. The paper concludes by considering the potential for gene patents to affect the provision of genetic testing services. There has been much discussion generated by the open source community with respect to patents. Specifically, the granting of software patents in the US has morphed into a strained and uncontrollable system due to the sheer volume of software patent applications it receives. It has been suggested that software patents are being granted without closer examination as to whether applications meet all of the necessary criteria. This has caused a major rift between software patent owners and the open source community, primarily as a result of software patent owners being granted their patents for claims that technically should be open and free to use in the open source community. The software patents that are being granted fall through the cracks of a patent system that has impacted on the Internet and software space. There have been numerous attempts to redress the imbalance of power that lies with the patent owner by various organisations, one being the Electronic Frontier Foundation (EFF). The EFF established ‘The Patent Busting Project’ in order to combat the validity of software patents that ought to be invalid due to the existence (although mostly undocumented) of prior art in the information and communications technology (ICT) industry. Whether the project has been effective in challenging the validity of software patents is presently uncertain. This paper will discuss and evaluate whether the EFF Patent Busting Project is an effective tool in addressing the conflicts that arise within the patent arena and open source licensing. Electronic commerce is a commercial activity with promising future prospects. Many goods and/or services can be contracted through it although the consumer and user can not be completely satisfied with them. With this aim, the Spanish legislator recognizes in favour of the consumer and user the faculty to desist, in the legal framework determined, from the contracts initially made. That legal background established can be improved considerably, at least in aid of the weak contracting party, through the self-regulation of the e-commerce, thanks of which, the codes of conduct have been developed. The rapid development of nanotechnologies has brought a large nanotechnology entrepreneurial sector that imposes risks, uncertainties assessment, and management procedures. This study focuses on the needs for nanotechnology specific regulation in the workplace particularly in the European Union (EU) with special reference to the Italian perspective. This paper analyses the legal protection duties for employers and investigates whether existing regulations in workers’ health safety cover nanotechnologies efficiently. In the annals of international copyright history—by and large synonymous with the Berne Union and the Berne Convention for the Protection of Literary and Artistic Works—translation occupies a contested space. At the end of the nineteenth century, as the nascent Convention tried to come to terms with the legal ramifications of translation and the way it challenged the perceived stability of the work, translation also acted as a conduit for geopolitical tensions between producer/user-nations. A conflict native to the Convention, the dichotomy between export/import and developed/developing nations returned with a vengeance during the calamitous Stockholm Revision Conference in 1967. In the following, I revisit this critical juncture in international copyright history to consider the divergent claims and counter-claims relating to translation and the dissemination of knowledge. The purpose of this essay is to contribute to a historically informed understanding of current processes surrounding the construction, dissemination and control of knowledge, as they materialise, for instance, in the WIPO Development Agenda. In the light of current European Regulations, both on emerging technologies and on new medicines, a whole life cycle regulatory approach towards products is suitable. Following this perspective, it is increasingly necessary to investigate in advance both the applicable ex ante regulations, in order to manage risks for humans and ex post protection approaches for those injured by innovative medical products. This essay describes the main liability issues connected to the new personalised therapies. The liability issues emerge on a two-fold profile. The first issue deals with the allocation of liability for potential damage consequent to a hybrid sale-service transaction. The complex nature of this transaction is, in fact, typical of drug lifecycle management (prescription, preparation, use, etc). The second issue pertains to the examination of the essential elements of the facti specie of damage within the condition of intrinsic techno-scientific uncertainty. Unavoidably, this condition characterises personalised medicine, because of a lack of clinical expertise. This article briefly summarises the current key developments in the area of patenting with a particular emphasis on patenting of software. The focus embraces the potential advances particularly in the United States and European Union. Old College, University of Edinburgh, 16-17 September 2010. The development of a consensus that ethical, legal and social issues are of the utmost importance in the governance of emerging technologies prompted the University of Padua to launch a new academic research initiative to seize the opportunities and promises of emerging nanotechnologies. It has established the Centre for Environmental Law Decisions and Corporate Ethical Certification (CIGA), in the Italian town of Rovigo, in the Veneto Region, with the aim of giving proper attention to their ethical and social sustainability.